Winter Homes on a Hill Holiday Cards by Desktop Publishing Supplies, Inc. are certified to impress your friends, family, or clients this holiday season! These exquisite Xmas cards are printed on a beautiful semi-shine cardstock and feature a few homes and trees on a snowy hill with a close up tree on the right side that has a cute bird in it. 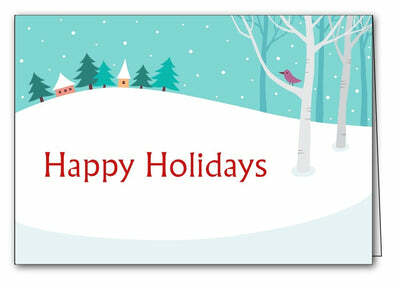 The words Happy Holidays are printed in red over the snowy hill.The inside of the card is blank for your customization. Winter Homes on a Hill Holiday Cards are packaged flat so you can run them through your printer for easy customization! Print a customized message, your favorite Christmas phrase, or even add photos to the inside of this Holiday card. Our Imprintable Holiday Cards are made from a semi-shine Matte, 80lb Cover (218gsm) Inkjet & Laser Compatible cardstock. These Holiday Cards measure 5" x 7" when folded and are pre-scored for easy folding. A matching amount of white envelopes are included.